The Turtles and Splinter are visiting London’s British Museum, and study a portrait of King Arthur, Queen Guinevere and the Knights of the Round Table. In Dimension X, Krang is using a long-range scanner and discovers a rare metal buried in a ruined castle in England. The metal turns out to be King Arthur’s legendary sword, Excalibur. 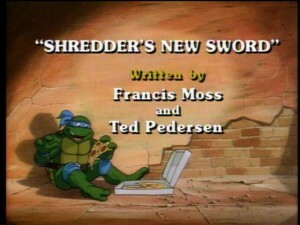 Shredder arrives in England and grabs the sword, which has the ability to raise ancient knights, and transform modern England into medieval England. When Shredder realizes its powers, he decides to forget Krang and rule England himself. The power of the sword stops the Turtles at every turn, and April and Irma are captured by the mutants, Shredder deciding to make April his queen. The final battle takes place at the ruined castle of Camelot, with the Turtles dueling with Shredder and the mutants in a medieval tournament. The spirits of Arthur and Guinevere rise and the Turtles defeat Shredder, returning Arthur’s sword to him.